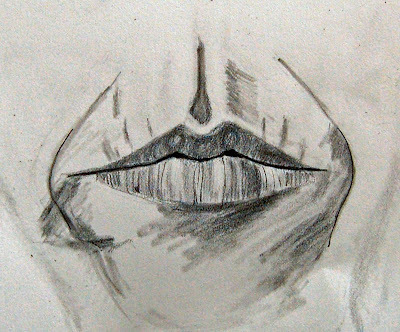 OK, I probably won't get a chance to draw my nose today - busy with other things and the weather is good, so I'm planning to get out and about (or maybe I'm using delaying tactics, as my nose is not my favourite part of my anatomy). I've started a little drawing project. I'm drawing a bit of my face each day. When it's done, I'll assemble it all in Photoshop Elements! I'm using our few days off to catch up on all my arty things: drawing, painting, blogging. The weather is helping - it's been completely miserable, raining non-stop for the last 2 days. I haven't stepped outside today - Willow only went out once, and came back in 10 minutes later, all mucky. We had to catch him at the door and wipe his paws with kitchen paper (it's a 2-person job). He'll probably run around the house like a lunatic tonight, full of energy, all cooped up, bored and dying to get out. But I didn't start this post planning to tell you all about our cat. I was going to talk about a book I read a few weeks ago, Netherland by Joseph O'Neill. Well, I'll try anyway, as I find it very hard to remember any details from books or movies after a month or so. It's the story of Hans, a Dutch guy who lives in New York. After 9/11, his English wife is a freaked out and put off by the new America, she leaves him and goes back home with their young son. He is lonely and takes up cricket, a game he used to play as a kid. The other players are all immigrants, from the Caribbean and India. He's the only white man on the team. He becomes friends with a man from Trinidad - Chuck Ramkissoon. Friends may be a big name - there is a lot that he doesn't know about him, but it doesn't seem to bother him. Hans eventually goes back to England and is told a few years later that Chuck has been found dead in suspicious circumstances soon after his departure. We watched Pan's Labyrinth on the telly last night (recorded a few weeks ago). I had heard about it at the Oscars, and thought it was a movie about the fantastic world into which a little girl retreats to escape reality. What I didn't realise was that the reality she is running away from is the brutality of Spain in 1944 after the civil war, with her step-father a sadistic captain fighting rebels hidden in the mountains. Yes, there is a fantasy world and the special effects are wonderful, but the real world is depicted in stark detail too, so be warned - some scenes were so graphic I couldn't watch. An excellent movie. Very dark. No happy ending. Well worth seeing, but don't expect to be uplifted - this is not Hollywood. And definitely not one for the children. I've cut out the ugly lumpy leaves (not literally - I cropped the picture in Photoshop Elements - I then created a collage in Picasa with the pieces and picked one of the dark blues from the painting as a background). Much nicer. Photograph is a bit blurred. I'll take another one tomorrow if the sun shines - you can't beat natural light. I finished the Bushy Park painting yesterday. 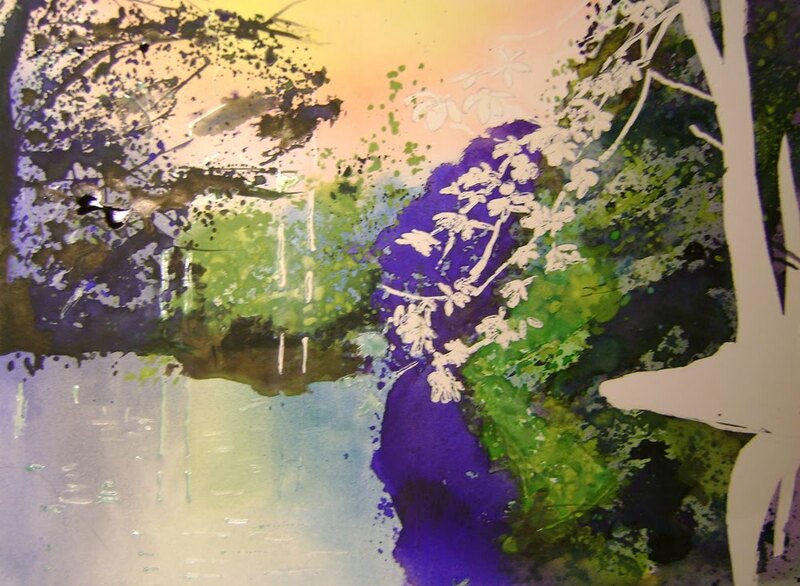 After completing the reflections in the water (they worked out quite well actually), I removed the last bit of masking fluid and painted the leaves on the big tree. I then added a few splashes towards the bottom left - it was a bit empty there and the water's edge just disappeared in a line that took the eye straight out of the painting. 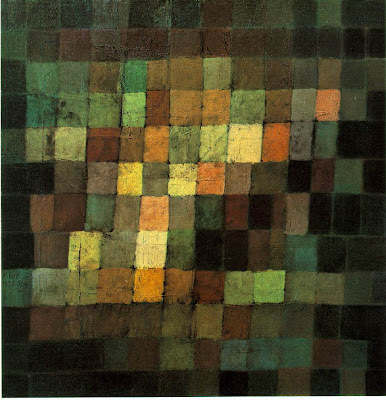 After a few splashes of green in the top right corner, I felt the painting was well balanced. 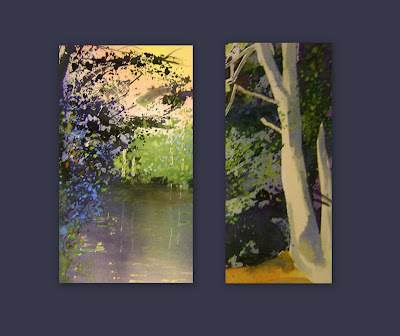 And I'm pretty happy with my tree on the right - I had masked it with masking film (the best thing for big shapes), and then I applied well-diluted ochre over the whole surface, and then a mix of payne's grey, ultramarine and lemon yellow for the shadows. 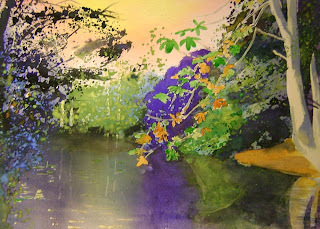 Check out this website for instructions on how to use masking fluid. Mary, Padraig, ... do not read any further. You will not like what you see! 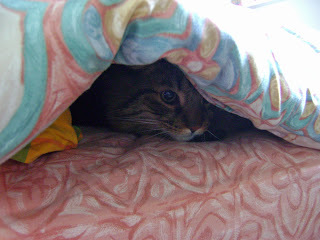 Willow sleeps in the front bedroom, on the bed - during the day, he finds shelter in an Ikea laundry basket turned on its side - it's dark, it's cosy, nothing can attack from behind. At night, he favours a white teeshirt that I've strategically placed against a pillow towards the top of the bed. But that's our guest bedroom. On the rare occasions when we have visitors, Willow has to find somewhere else to sleep (there are many soft chairs, sofas and beds for him to choose from). 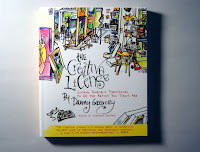 Check out this blog from the author of The Creative Licence, one of the books that Santa brought me this Christmas. Slowly re-emerging after Christmas. My parents were over for the last week. They left yesterday lunchtime, after a good week, plenty of relaxation and good food (and Trains Trains Trains on the History HD channel!). It will take me a little while to get back into the swing of things, after re-taking possession of our house. Spent most of today on my current watercolour project. Have got plenty more drawing and painting to do, and plenty of books and brushes and paper and paints to help me along the way! I'm onto my next project - back to watercolours for a bit. 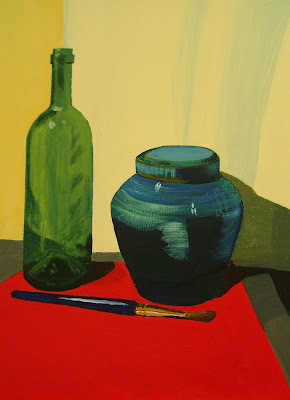 Much more familiar territory than acrylics, though my still life is encouraging enough. I'm trying a pouring and splashing technique - great fun but very messy - my curtains are full of little dark dots, and I was glad of my new Cheap Joes' apron (my anniversary present!). Masked the leaves and tree trunks. Poured about a dozen different colours and tilted the board back and forth to try to merge them gently. Then started splashing colour from the right. And went on splashing from right to left. Half way through, I decided to do the water separately. I'm not sure how that's going to work for the reflections I've already painted. I'll have to float water through the lower half of the painting and hope that the existing greens and purples lift enough to look watery, but not so much that they start mixing and going muddy. Went into town yesterday for an hour or two - we had a few bits and pieces to pick up from Asia Market (it looks nothing like the photo - I think this is their "trade-only" warehouse in some industrial estate), so we decided to have a little potter around, to soak up the pre-Christmas atmosphere. There wasn't as much of a buzz as I had expected - while the streets were busy, the shops were not. Pleasant if you were buying something, but a bit disappointing if you were just looking like me! Sad to say, but the atmosphere was much more festive in Dundrum Town Centre, where there was a big choir on the top floor singing carols for charity, that put you in Christmas mood as you walked in. The shops were fairly quiet (it was after 5 so I would expect that - though the centre was open until 9 pm last night). I asked a shop assistant in Marks & Spencers if they'd been busy, and she said it had been a steady stream, and this was the first time it was quiet in the whole day. The Belgian Truffles were still half price (so we bought another 2 boxes) and the big Belgian tin of biscuits was well reduced too (1kg cheaper than the 400g tin), so we stocked up on those too. You can never have enough of Belgian goodies! Traffic was chaotic around the car park exits. We were walking so we didn't care (except it was very cold). But what happened to the ice rink? It was closed, which we found very strange at 5pm. There were plenty of teenagers in the shopping centre, who, I'm sure, would have been happy to spend an hour or two ice-skating. There is no mention of it on the website - strange? Hey, just found this on Boards.ie: "Hi everyone, just wondering if anyone knows why the Dundrum ice rink is not opening now? It was all set to go, so much work was done and it looked great and then they posted this on their Facebook? Dundrum On Ice* * * * * * * * Friday 11th December. We regret that due to circumstances beyond our control Dundrum on Ice has been cancelled for this season. People who have booked tickets through our on-line system will be refunded directly to the credit or laser card used to make the booking. Refunds will be processed within the next 7 days." I wonder did they have problems getting insurance or something like that? Aine McAteer was on TV3! I read the book a couple of years ago and loved it. So I got the movie on the web as a download for my iPod Touch, but it wasn't the one I was expecting - I thought I was getting the BBC drama, but I got the Hollywood movie instead, with Nathalie Portman and Scarlett Johansson as the 2 Boleyn sisters. Very lavish, beautiful costumes, and a good film overall. Nathalie Portman's portrayal of Anne Boleyn in particular I thought was excellent - seductive, manipulative, but ultimately doomed by her failure to produce a son for the king. After many years with Patricia Murphy, Lucinda and I decided in the summer that we wanted to try out a new yoga teacher. We found that Patricia was veering more towards fitness training than pure yoga, and it didn't appeal to us as much. So we found Lisa Burke, of the Danu Yoga Centre, through a hill-walking friend of Lucinda's. I tried a few drop-in classes in the summer, and we decided to enroll in September. We haven't looked back since. Plenty of stretches, breathing and relaxation, and also lots of challenging postures. We're learning new things at every class, new ways to twist and bend our bodies. And it's all in good fun - I feel happy after the class, uplifted and full of the joys of life. And the room is warm and softly lit, with pillows and cosy blankets at the ready for our relaxation at the end of our practice. I've always been a fan of Solitaire on my computer. I find it's the best way to clear the mind before starting work. But I'm fully aware it's an addiction, really. When I used to work in Gecap (a long time ago), we had Tetris on our machines, and I could spend ages playing (if I had nothing else to do and if Mervyn wasn't in the office, which is not that often, now that I think of it!). I definitely don't want Tetris on my computer here, or that will be the end of my productive life! 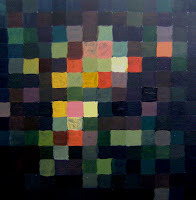 This is my second preparatory painting - acrylic on board (about 21cm square). The photograph doesn't do it justice (I find it very hard to take pictures of acrylics, as the light bounces off them more than from watercolours). The black background has made a huge impact - even the yellows work better. The big question now is what size to go for - from what I've read on the web, the original is only 37 cm square. I thought it would be much bigger. I'm thinking of 60 cm square (it would fit on the pillar in the extension), but I'm not sure if the colours will hit off each other if the squares are too big. They currently are 1.5 cm each. I would have to make them about 5 cm each (roughly the same size as the squares on my Christmas cards). I don't know if the eye will process them in the same way. Right now, when I look at my mock-up, I see it as one unit, and the colours bounce off each other. Will 5cm squares sing the same song? Well, we won't know until we try, shall we? The clue is in the title - I'm now going to try it with a black undercoat before I paint the vibrant colours over. I've just completed a small practice run on bristol board, but it just doesn't sing to me. A closer observation of the original online (seen below) is telling me that black is the foundation that makes the colours sparkle. 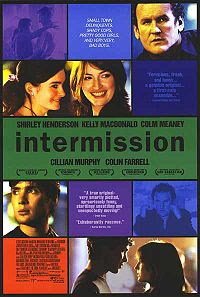 Brendan got a loan of the Intermission DVD from Niall last week, and we watched it a few days ago. It was better than I expected, but I think that Brendan found it somewhat disappointing. It's an Irish movie, with Colin Farrell, Colm Meaney (of Star Trek fame), Cillian Murphy (known for his piercing blue eyes), Kelly MacDonald (she was in No Country for Old Men) and a few other familiar faces from the Irish cinema scene. It's a gangster story, and it's also a love story (or multiple love stories). It's funny in parts, and violent in others. I found that the opening scene was quite a shocker. I'll say no more. I enjoyed it because it didn't take itself too seriously, but I think that's what Brendan didn't like about it - the fact that it's all a bit too slapstick. Also the fact that the acting style came straight out of "Fair City" (an Irish soap that neither of us can stand, as the acting is wooden and the lines all too predictable!). Note that the credits state that "no animal was killed in the making of this movie". I wonder was the sheep already dead? Next project? A commission from Brendan - he would like a big painting for the top of the stairs, something along the lines of Ancient Sound by Paul Klee. Looks easy? I'm experimenting with colours at the moment, and it's not looking too good. Maybe it will all come together when I fill in the last square, but right now it's too grey and brown for my taste (and I'm only using 3 colours + white + black). Maybe I should go for completely different colours. I was quite inspired by the "Creatures of the Deep" episode of the BBC's Life series (narrated by David Attenborough). By the way, if you're curious about the technicalities behind it all, you'll find more information in the Wikipedia article - for instance: Do they film everything in the wild? How can they film a moving herd from a distance in a helicopter and it all looks so smooth? The deep reds and browns on the starfish in the Antarctic, the flashing purples and whites of the mating and fighting cuttlefish, and of course the complete spectrum of the Great Barrier reef corals and fish. All wonderful hues, but which ones to pick? Christmas Cards all done and sent! Since I got my hair cut and I got new glasses, I thought I would change my Facebook profile picture. Should I do the same for my Blog picture?